The Crater Health District encompasses approximately 1800 square miles and serves a population of about 150,000 residents. The District includes the cities of Petersburg, Hopewell and Emporia and the counties of Prince George, Dinwiddie, Surry, Sussex and Greensville. To be a strong, well-respected organization working closely with all aspects of the community to improve and protect the health status of the citizens in Crater Health District. To foster healthy communities through disease prevention and control, health promotion, environmental protection and emergency preparedness and response. The Crater Health District is a state-city/county cooperative health service agency. We have over 100 full-time employees, 10 part-time employees, and countless volunteers each year. 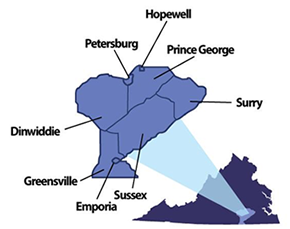 The Health District operates seven local health departments in Dinwiddie, Emporia, Hopewell, Petersburg, Prince George, Surry, and Sussex.